Olympic gold medalist Henry Cejudo shocked the world this past (Sat., Jan. 19, 2018) at UFC on ESPN+ 1 from inside Barclays Center in Brooklyn, New York, when he dismantled current bantamweight champion T.J. Dillashaw just in 32 seconds to retain the title. However, that win doesn’t go well with many including Dillashaw and UFC head honcho Dana White who said early stoppage was horrible. Many in the MMA world, not even know who’s Cejudo thanks to the controversial win that buzzes around his name on social media. Regardless of people are critical of his victory, ‘The Messenger’ is happy and took advantage of the moment. Earlier this week Cejudo sat down with Ariel Helwani, where he recalled his meeting with John Cena’s ex Nikki Bella’s Twins on a flight and express his desire to go out with reality superstar. Interesting part Bella accepted Cejudo’s date and replied him back via video. She congratulates him on his win and even said we could grab a drink sometime. Now Cejudo is on the seventh sky after hearing that Bella accepted his request. It seems like Cejudo is having quite a time after his recent win. His rival Dillashaw is angry on the early stoppage and demands an immediate rematch at UFC flyweight title. However ‘The Messenger’ shares his terms that he’ll only run it back if it’s for the 135-pound title. Anyway, Cejudo has plenty of time to think what’s next for him but at the moment he’s flying high after Bella acknowledged his offer. 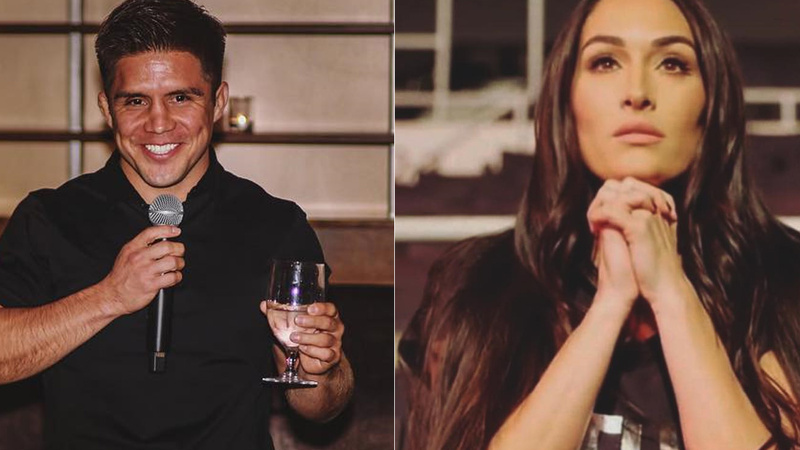 Henry Cejudo is down to have a wine with Nikki Bella. Previous articleManny Pacquiao, Floyd Mayweather Share Awkward Handshake At Lakers Game!